FEATHERED SERPENT 9 in. - 3-1 edge in Amethyst. 9 in. Blue ruffled FEATHERED SERPENT with HONEYCOMB & CLOVER Ext. Amethyst FEATHERED SERPENT - 5.5 in. Diameter. Green FEATHERED SERPENT - 5.5 in. diameter. FEATHERED SERPENT IC shaped 9 in. bowl - Marigold. Left - FEATHERED SERPENT - Green - 9 inch. Right - FEATHERED SERPENT - 9 in. 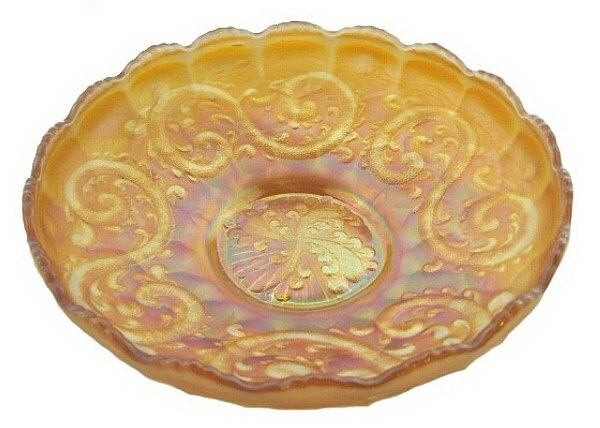 bowl in Marigold. 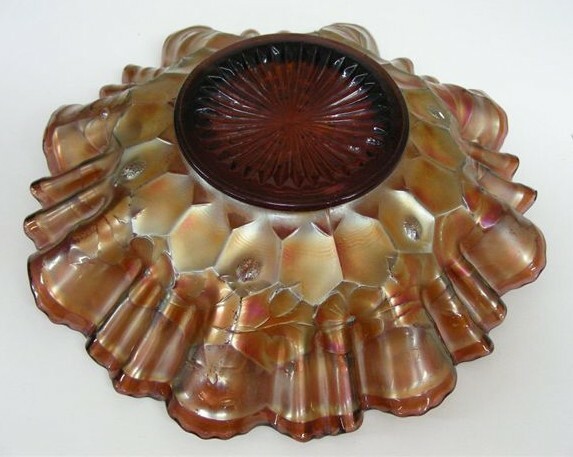 FEATHERED SERPENT: This pattern was given #437 by Fenton Glass and appeared in 1910 & 1911 Butler Brothers Wholesale Catalogs. 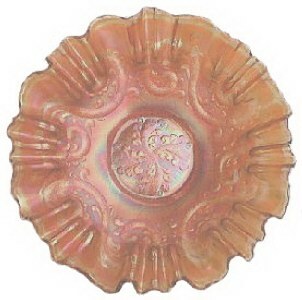 It is a scarce pattern in either the 9” or the 5 ½” size bowls. 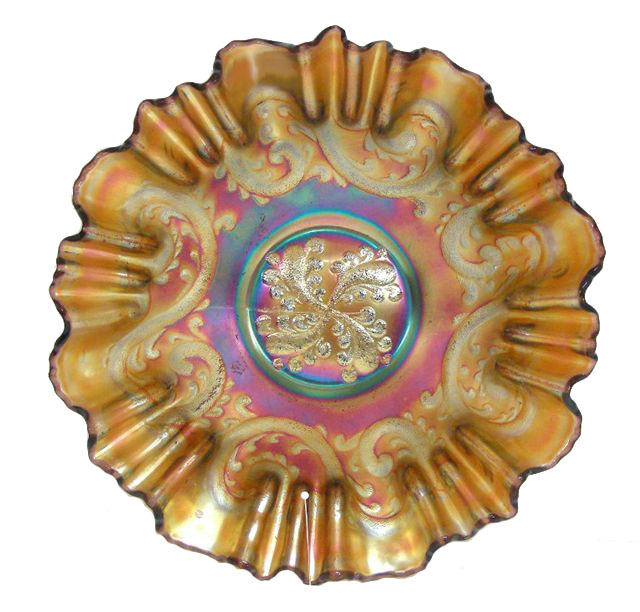 Colors known are amethyst, blue, green and marigold, indicating that it probably did not continue in production late in the era. No white or red examples have been found. 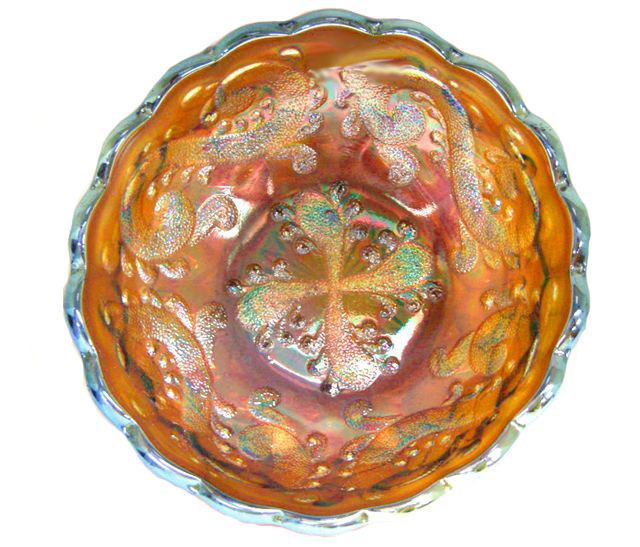 We saved the picture of the marigold 3 and 1 edge bowl for quite sometime, hoping for availability of other colors/shapes before highlighting them in a segment. When Mickey Reichel provided his brochure for the Oct. 9, 2010 auction, our prayers were answered! At our request, he very graciously provided the 10 photos we display here. This provides the full array of known colors, along with some great angles on the very interesting HONEYCOMB & CLOVER exterior pattern. We thoroughly appreciate his willingness to accommodate our request. Fenton Glass -The First Twenty-Five Years displays a table set in green glass trimmed in gold - circa 1909. 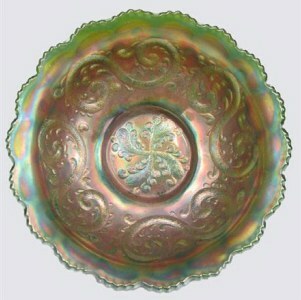 A green opalescent butter dish also appears there. A blue opalescent master berry bowl, along with a spooner and creamer of the same blue opalescence is also shown. FEATHERED SERPENT 9 inch Bowl. Feathered Serpent - 5.5 inch Diameter. 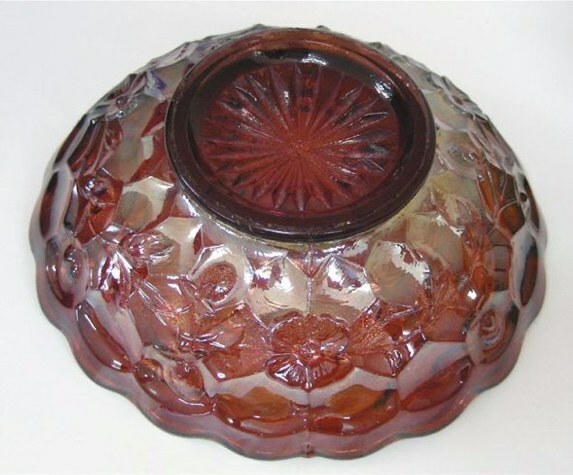 HONEYCOMB & CLOVER Exterior pattern: Obviously this was carried over from the earlier era of glass and opalescent examples; to enhance use of the carnival glass pattern: Feathered Serpent. Apparently it had met with success in earlier sales and Fenton thought it would enhance acceptance of the new interior design. The berry set size molds fit perfectly for exterior application. HONEYCOMB & CLOVER BonBon - Green. HONEYCOMB & CLOVER BonBon - Marigold. 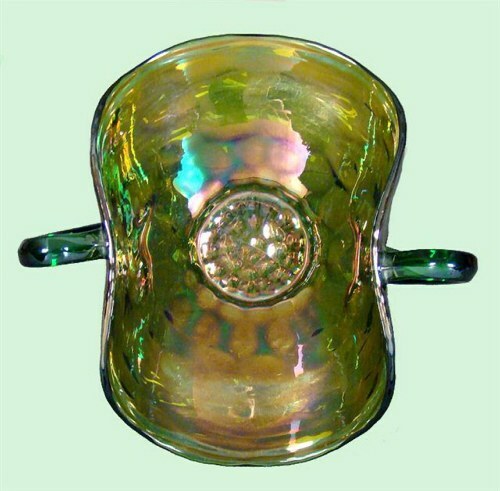 HONEYCOMB & CLOVER Bon-Bon: Using the spooner mold, producing a green glass base,then flaring the sides to form the bon-bon shape, the only additional step required to create this carnival glass bonbon: Spray the interior with iridescence. They are few and far between, but the single example we have examined relates this procedure was used. 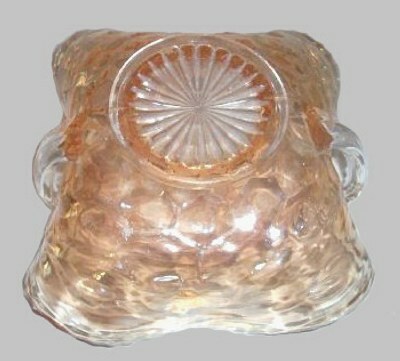 There are also very scarce clear glass bonbons having the interior marigold overlay. 5”-6” sauces in a very scarce pattern called PEBBLES also utilizes this Honeycomb/Clover exterior pattern. Pebbles vaguely resembles the Imperial Cobblestones pattern, except that Cobblestones bowls are 8 ½”-9 ½” in size and carry the Arcs exterior pattern! 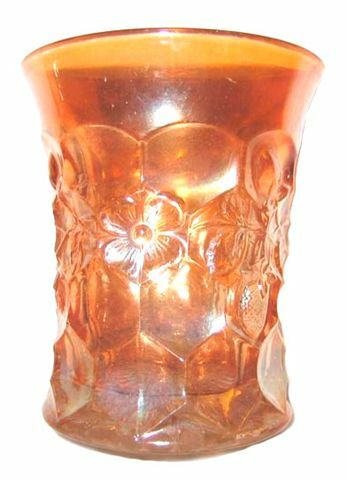 HONEYCOMB & CLOVER Tumbler: There is no record of a water set in this pattern. At least one marigold HONEYCOMB & CLOVER Butter Dish is known. The early Freewill Baptist evangelist, David Marks, rode his horse into Ancaster, Ontario, announcing he would preach. A crowd gathered ‘round and Marks asked whether anyone had a topic to suggest. Mockingly, a man said, “Nothing!” Marks began preaching: God created the world from nothing. He gave us laws in which there is nothing unjust. There is nothing in us to justify us. There will be nothing to comfort sinners in death. But while Christians have nothing of which to boast, we have Christ. And in Him, we have nothing to cause us grief, nothing to disturb our peace, and nothing to fear in eternity. Finishing his sermon, Marks mounted his horse and left. Even a sermon on nothing can save souls----for nothing is impossible with God!